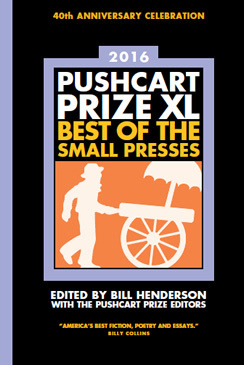 We are delighted to announce that the 2017 Pushcart Prize anthology—Pushcart Prize XLI—will include three stories from New England Review: “The Devil’s Triangle” by Emma Duffy-Comperone, “Forty-Two” by Lisa Taddeo, and “I Sing You for an Apple” by Eric Wilson. New Stories from the Midwest 2015, to be published by New American Press, will include “Three Marriages” by Emily Mitchell among its 25 selected stories. Plus, listed among the anthology’s “Distinguished Stories” are “Sloth” by Charlie Baxter, The Couplehood Jubilee” by Christine Sneed, and “Clear Conscience” by Christine Sneed. Look for both anthologies in fall 2016.